Hello! Planning or thinking of a VACATION in Aruba or Cuba? Natalee Ann Holloway (born October 21, 1986) was an American student from Mountain Brook, Alabama who disappeared on May 30, 2005 during a high school graduation trip in Aruba. Holloway's disappearance was first discovered by her classmates, who were in Aruba celebrating their graduation from Mountain Brook High School, when she did not arrive at the airport for her return flight. Holloway was last known to have been seen outside of a local restaurant, Carlos'n Charlie's, with Joran van der Sloot and brothers Deepak and Satish Kalpoe. The three men were suspicious enough to be arrested 7 times but remain free men under "Aruba LAW". Throughout the search, Aruban investigators were criticized by Holloway's family for a perceived lack of progress. Holloway's family even called for a boycott of Aruba, which gained the support of Alabama Governor Bob Riley, but which failed to gain national backing. The suspects in Natalee's disappearance investigation, Joran van der Sloot and brothers Deepak and Satish Kalpoe were in fact the culprit to Natalee's diappearance. Natalee's mother and father eventually left the Aruban island and the search and media halted its activities. Joran van der Sloot fled to the Netherlands where he confessed to a friend on hidden video that he in fact accidentally killed Natalee Holloway after she went through non stop convulsions and stopped breathing. Joran van der Sloot immediatly called friends Deepak and Satish Kalpoe to help him dispose of the body and cover up the inncident. Joran van der Sloot fled to the country of Peru after finding out he was secretly recorded confessing to the murder of Natalee Holoway. In Peru, Joran van der Sloot murders another innocent girl, Stephany Flores from Peru, in his hotel room but this time he is caught by police authorities and the help of the hotel's surveillance camera videos. One of the Kalpoe brothers was found dead hung by the neck on a porch. In Aruba, the disapearance and cover up was possibly aided by the suspect's father, a member of the Arubian government judiciary district. Joran van der Sloot led the U.S. and victims of this atrocity in a long long merry go round of injustices. The list of atrocities fidel castros communist goverment inflicts upon Cuban citizens goes on and on. Visit Capitital Hill Cuban's Website to see and learn more about Dr. Darsi Ferrer and his struggle for democracy in Cuba. Cuban prisoner of conscience and journalist Juan Carlos Herrera Acosta sewed his mouth shut and was believed to continue his action Saturday, December 30, dissidents said, despite pleas from fellow persecuted Christians not to do so. Organizations with Power don't want to do anything, less say anything. United Nations, U.S.A., and Great Britain has sent zero (0) help or solution to end fidel castro and his oppressive tyranical goverment. Natalee Holloway remains missing. No trace as to what happened to this girl while vacationing Aruba. Natalee Holloways' mother feels like someone is holding out on the truth about what really happened to her daughter in Aruba. Fidel Castro's communist goverment, funded by TOURISTS, continues its 49th year of oppression in Cuba while at the same time terrorizing its Cuban citizens. Nancy Gonzalez Garcia was ambushed by state agents while leaving home with her husband. They were both beaten up bad and threatened. Nancy Gonzalez GarcÃ­a is a librarian who is trying to practice the right to read, write, and distribute written literature. 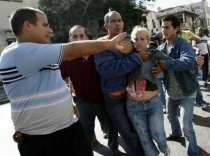 Orestes Suarez and his wife (above) were badly beaten while leaving their home to attend a organized meeting of Cuba's Independent Librarians. They were assaulted by plains clothes state agents. Orestes Suarez and his wife are librarians who are trying to practice the right to read, write, and distribute written literature. Orestes Suarez and his wife Nancy Gonzalez Garcia were assaulted and badly beaten by fascist mobs, organized, paid and directed by the Castro regime. Dr. Ferrer and his wife Yusmaini being assaulted by mobs organized and controlled by the Castro regime. Dr. Ferrer and his wife Yusmaini sustained numerous bruises to their faces and body from the results of these assaults by fidel castro. 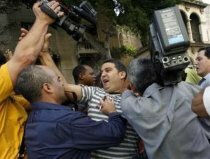 The same thugs who attacked Dr. Ferrer and his wife, also attacked foreign journalists who were trying to cover the protest. 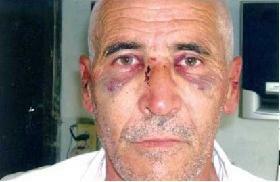 See Videos of the December 10, 2007, brutal attack against Dr. Darsi Ferrer, his wife and other Cuban dissidents.